When we think about creativity and creative people we tend to think of famous artists, writers, musicians, photographers or more recently, film makers. Each of these use a different medium, some creating with words, others creating with pictures. Today different technologies have enabled a huge growth of creative mediums. You can create through all the traditional avenues, like writing, music, film and painting — but Tumblr, Twitter, Instagram, Snapchat and YouTube have created totally different forms of these mediums. All of these are interesting to create in but all of them can be fundamentally changed with code. Code isn’t a medium like the others. Code enables a new opportunity for all mediums: interactivity. Back in 1977 the first work of interactive fiction written on a computer went “viral” (well as viral as something could go amongst the 111 computers on ARPANET). 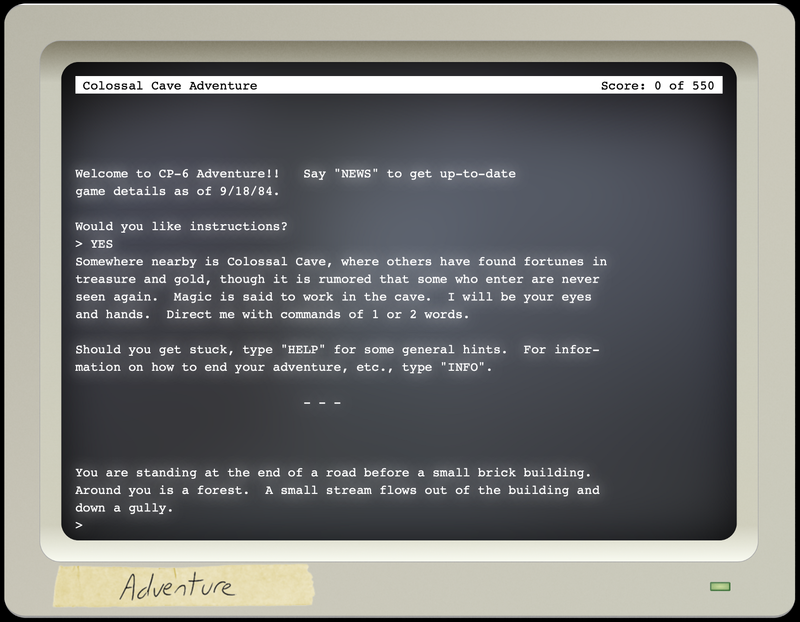 Colossal Cave Adventure is what happens when you take code and fiction and mash them up together. Often fiction is about experiencing a story, a different world totally different to your own, but the protagonist of that story is always someone else. Interactive fiction allows the protagonist to be you. Instead of reading about the world through the eyes of a character, you could experience it and drive the narrative yourself. We can see echoes of Colossal Cave Adventure in the many works of interactive fiction coming out of Indie video game studios. These pieces of fiction can create experiences well beyond a novel, connecting emotionally through a first person perspective that you control. Building interactive fiction can be an engaging way to learn language, story telling and coding. I’ve talked about how these work as introduction projects before in Making games is not the only way to learn code. Beyond interactive fiction, some modern video games have become interactive films. They include a full cast of actors, sound effects, music, level designers (who act as interactive set designers), character artists (interactive makeup artists) and much more. All of these roles are powered by coding, or include coding themselves. In the years to come we’ll likely see these extend to virtual reality experiences and increase in fidelity to the point where it is indistinguishable from reality. Why watch… when you can be? In a completely different field, innovations in the way we present data through coding has meant an entirely new type of journalism is developing. Data journalism hopes to inform people by analysing data and presenting it in a form that regular people can understand. Interactive data journalism takes this to another level, by interacting with data and models we can improve our understanding of the data. We can also customise it to ourselves. Understanding how government policy impacts people broadly is useful — but understanding specifically how it impacts you and the people you care about is much more relevant. 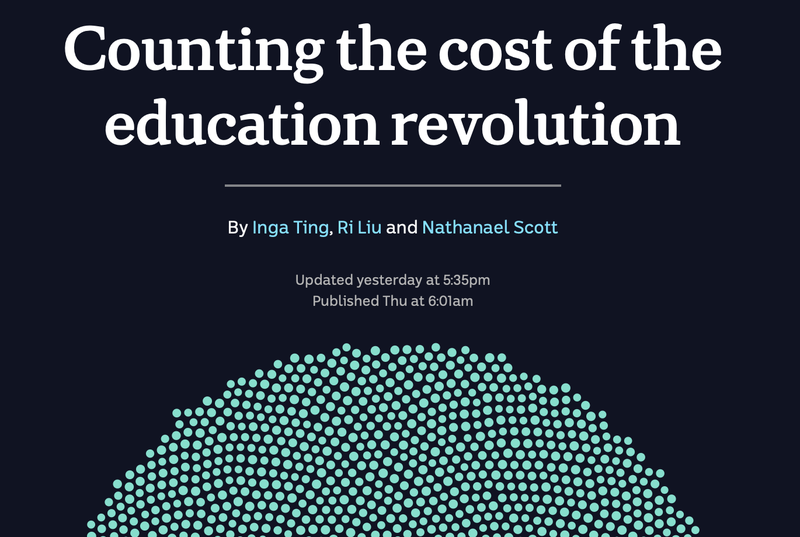 Counting the cost of the education revolution explores school funding data interactively. Nicky Case develops “Explorable Explanations” which combine data and simulations with explanations. This form of learning and understanding through play has only been made possible because of coding. In their “Parable of the Polygons” (developed with Vi Hart) they explore how individual, harmless choices can have flow on effects that impact everyone. In many ways this piece could have been done more simply as a report, with charts and graphics. But by making it interactive it’s much easier to follow the why of how these processes happen — rather than just the what. Beyond explaining real world data or concepts for educational purposes, interactivity is a powerful way to communicate. Art without interactivity leaves a barrier between the art object and the audience. With interactivity that barrier is gone and our actions influence the art, which in turn allows the art to influence us more powerfully. This connection to the art means that artists can communicate new and old ideas in unique and different ways. Scott Snibbe is a well known interactive artist, watch him talk about his work and about interactive art in general. Ultimately the power of code, and interactivity is how personal the result is. Historical works of creative endeavour have been powerful and connected deeply with people. Vincent van Gogh, Shakespeare, Jane Austen, were all able to make these connections through works with a barrier, works that never fully involved the audience. With a new age of creative work that can change in response to the audience, how much deeper will that connection be? We hope you’ve enjoyed this article. If you really liked it, please clap or share it on social media. We’d also love to hear what you think the future of creativity holds?